Guy Levi works as Director of Innovation at the Center for Education Technology (CET) in Tel Aviv. He studied politics and sociology in Tel Aviv and New York and spent many years researching 20th century colonialism. 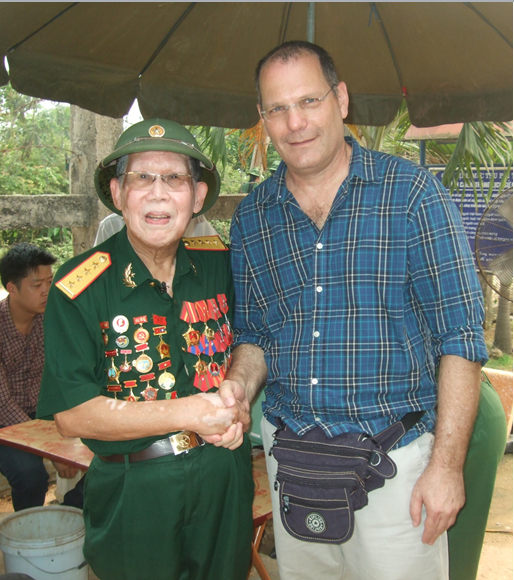 In 2005 he visited Vietnam, the Mekong Delta and Saigon where he was exposed to the fascinating character of Ho Chi Min, the founding father of modern Vietnam. In 2009 he travelled to Hanoi in order to see his hero (embalmed in a mausoleum), and fell in love with the city, its residents and its culture. Upon returning to Israel he wondered how he would maintain his newly acquired love and decided to write a novel about Vietnam. In 2014 he returned to Vietnam in order to re-encounter his characters and design the story plot. Guy lives and writes in Tel Aviv Israel. This is my workspace, in the small dining area on the left of the kitchen. I don’t need anything but my computer, which usually isn’t even connected to the electricity. I write mostly on weekends, in the early morning or evening, when all members of the house are busy doing their own thing. Sometimes someone may pass by or cook next to me, but it doesn’t affect my concentration or my writing. When I just began writing the novel, I would recluse myself at my parents’ house on the kibbutz, when they traveled overseas. On one occasion, I didn’t step outside for four days and wrote for eighteen hours straight. I have noticed that it takes me time to get into a profound writing mode, so isolation is a treasure. All I need in order to write is a computer and a network connection. This book couldn’t be written in a world with no internet. My writing is very associative and I need immediate access to information and quick answers to the questions that pop into my head. When I write, I have about 20 open tabs in my browser, as I skip from one to the other according to the ideas I have. One moment I need to compare between the Vietnam provinces in order to decide where a character was born, and the next moment I need historical findings in order to define the character’s familial background. Wikipedia is my main source of information. One of the characters in the novel is a young boy with no father or mother figure, who ran away from his poor village to Hanoi. The boy is adopted by one of the older characters, and when this character holds his hand warmly, he cries for the first time in his life. When I described the tear rolling down his cheek, I suddenly asked myself – what is a tear? and discovered that there are actually different kinds of tears, with various chemical structures. Tears of excitement, for example, contain a hormone which is supposed to relax the body, while onion tears are meant to protect our eyes. These pieces of information that I am exposed to during my research are collected in my head or on the computer, and eventually they enter the story. My writing is a never-ending process of discovery. If my book will ever be published I’ll probably dedicate it to Wikipedia. I write on Microsoft Word but back everything up on Dropbox. I don’t take risks. I don’t print out my writing; everything is digital, organized in computer files. I don’t use notes either, nor do I use notepads or notebooks. If I’m not by my computer, I write my thoughts down in my smartphone’s Notes app. I believe that if you don’t pay attention to your thoughts, they will disappear. If you don’t hang on to an association, it will leave. When I write I need coffee beside me. It can be hot or cold. Coffee is part of my thinking process. I only drink my coffee out of this mug because when clasping it, it feels like an extension of my body. When I lost it one day, I went crazy until it was found. I don’t eat while writing, except for chocolate or halva, both can be easily drawn out of the first shelf of the fridge door. All I need to do is stretch my arm backwards. This is where my earphones, which have gone missing, usually are. I often use them to listen to Vietnamese music, like this singer. With the help of Google I can translate the words to English or Hebrew with a click of a button and the meaning unfolds before my eyes. This is where our dog sleeps while I write. His presence soothes me. Every morning, before going to work, I iron my clothes. And every single time I do so, I recall Murakami’s book The Wind-Up Bird Chronicle and the character’s clothes ironing ritual. It helps me examine the way small details of life are expressed in literature and refine their reflection in my writing. My writing is influenced by my two favorite authors: Jose Saramago and Haruki Murakami. From Saramago I borrow the writing style, not using quotation marks for example. And Murakami calms me. I read him slowly and remain flabbergasted by his language and metaphors. When I think of the journey my characters are on, I see them both in my mind’s eye. When I think, I tend to detach myself from the screen and raise my head. This is what I see. The distance between my seat and the balcony banister is 12 meters. One cannot see the street from the second floor, only the trees across the road, the chairs on the balcony and the coffee mug of whoever sat there a moment ago, maybe it was me. This frame that I see is autonomous of space and time, so it can easily become the view from a hotel window in Hanoi, or any other place I want. My point of view helps me think every time I need to set all the data aside and enter the realms of my imagination.